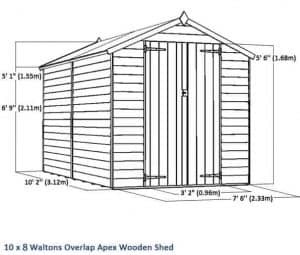 This affordable overlap apex shed by Waltons offers surprisingly durability. Designed as a basic storage facility, it comes with solid sheet boards for the roof and floor. These materials ensure the floor provides enough strength to support medium-weight tools and equipment. The apex roof supplies added height inside the building, helping to give you more space to manoeuvre, as well as to store taller items. The double doors feature a butterfly catch to keep them closed even in high winds. The 8mm overlap cladding provides great water-resistance and also gives the shed a more traditional look. This is also a windowless building, which means that maximum privacy is guaranteed. However, it does mean there will be no natural lighting in the shed. This isn’t generally a problem though as it is designed as a storage facility only and is not ideal for use as a workshop. The included sand felt offers heavy duty protection, further enhancing the roof’s weatherproof qualities. As if this wasn’t enough, the shed is also covered by a 10 year anti-rot warranty. Considering its low cost, we are impressed by its overall quality and design. Waltons never fail to produce high quality results and this shed is a shining example of just how affordable quality can be. Though this does come with a butterfly catch, there is no lock included. This is a simple and inexpensive problem to fix however as you can add a 49mm weatherproof padlock to your order. Its unpainted, natural finish may be off-putting for some. Though again, this is a simple problem to fix as you can either use a colour based treatment, or paint the shed after it has been treated. 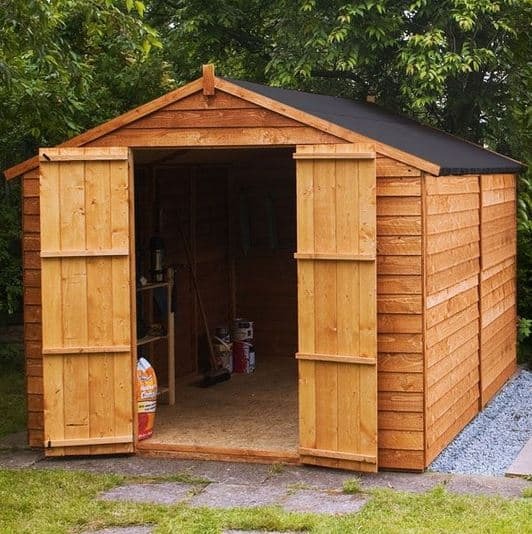 This is a general, simplistic wooden storage shed with a brilliant apex roof. Everything about this shed boasts a timeless, traditional design. It is actually part of the value range, though it offers a lot of excellent water-resistant features. The apex roof is a classic example. Used on most sheds, this roof style ensures rainwater doesn’t become a problem by causing it to run down and off the building. It is also covered with a heavy duty sand felt which comes free with the building. So not only do you get long lasting water protection, but the roof is also protected from any damage that could be caused by falling debris. It isn’t just fantastic water-protection you receive from this roof design either. It is also responsible for adding more interior head space into the shed. This is because it is shaped like an upside down ‘V’. So centrally, there is a lot of height where you can store taller equipment. The eaves come with a 1.55m height, while the roof features a 2.05m height. In width it measures a modest 2.32m, while its depth measures a great 3.12m. The doors also have a tall design, measuring 1.68m and a width of 0.96m. As the shed is part of the value range, it is made from 8mm Overlap cladding. Out of the three main styles of cladding, overlap is the least expensive for manufacturers to use which is why it tends to be a popular option for basic level sheds. However, don’t let the fact that it is the cheapest cladding put you off. It actually provides great durability. Thanks to its overlapping design, it manages to provide a water-tight seal. It is very similar in appearance to what you would see on garden fencing. The 28mm x 28mm frame is more than adequate to hold the weight of the cladding. As you enter the shed you can see just how sturdy the framing is and this helps to give you great peace of mind. While a floor is included with the building, it is only constructed of solid sheet materials. Now this is actually more than suitable for withstanding light-medium weight items. It measures 10mm thick and is pretty easy to install. If you do find that it isn’t as sturdy as you would like, you do have the option to upgrade. Waltons also provide a free support pack which will improve the strength of the floor. However, if even that isn’t enough you can invest in the Extra strength support pack which you can find out more about in the ‘Customisation Options and Extras’ section of this review. 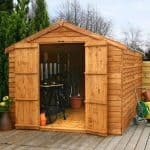 All wooden sheds require some form of preservative treatment. However, as this is created with Overlap cladding, it will require more frequent treatments than Shiplap cladding in order to ensure it really lasts. The cladding isn’t durable enough to provide protection throughout the seasons if it is left untreated. 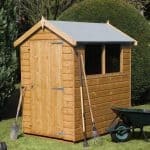 There is a great 10 year anti-rot guarantee with this shed, though in order to qualify you will need to ensure you do follow the treatment instructions carefully. Treatments are required both after it has been assembled and then yearly thereafter. Double doors feature on this shed which help to give a brilliant point of access into the spacious interior. It ensures you don’t have to worry about transferring awkward items in and out of the shed. They also have a ledge design so you can choose to add a hasp and staple if you really want to. One thing that is worth noting is they don’t feature diagonal cross-beams. This means that they have less protection against sagging over time. However, as the building is created with fairly light overlap cladding, this shouldn’t be an issue. Waltons haven’t included windows with this shed which is one of the reasons why it is so affordable. It also gives the building a more solid, private design. One of the things that we feel could be a little better with this shed is its level of security. It comes with a butterfly catch which means the doors will stay closed when you need them to, but they won’t be locked. There is no lock provided, although the good news is that locks are fairly inexpensive to purchase. The windowless design does make it ideal for those looking for privacy. However, before storing anything of value in the building we do recommend that you invest in a good locking system. There are four main customisation options and extras available, two of which are definitely worth investing in. The first that we recommend you buy is the 49mm weatherproof padlock with hasp and staple. At just £9.99 this powerful lock boasts some truly spectacular features. It will also solve the shed’s security issues. The lock comprises of a brass cylinder, steel laminated body, thermoplastic weatherproof jacket, double locking system and a protective cover which fits over the keyhole. The second extra we highly recommend is the 10×8 Waltons Portabase. This may seem like an expensive additional purchase, but it actually provides a pretty important feature. In order to make sure that the shed is sturdy, it absolutely needs to be built on a level service. The Portabase acts as a fantastic base for the shed, also helping to lift it further off the ground. This provides the additional benefit of protecting it against damp and rot. Another extra you might want to consider, but which isn’t classed as an ‘essential’ purchase, is the Superior duty roof felt. Made from top quality fibreglass, the roof felt is easy to install and it offers a much better level of water-resistance than the heavy duty felt supplied. However, the heavy duty felt is still really durable so it’s more a matter of preference whether you choose to upgrade. Finally you have the extra strength floor support pack. Now, as Waltons do provide a free standard floor support pack, this isn’t technically an essential upgrade. However, it doesn’t just support the weight of heavy items, it also helps to give you peace of mind whilst you are walking around inside the building. So again, it is down to personal preference whether you want to invest in this pack. 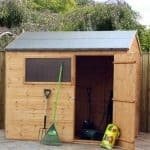 For an entry-level shed, this building has a great high quality design. The ledge doors and sturdy framing help to ensure the shed is structurally stable and it also benefits from a traditional, attractive design. The 8mm overlap cladding does provide good durability, though it is very important that you treat the timber with a high quality preservative. This will need to be done on an annual basis. Obviously with a value design, you aren’t going to get the maximum longevity benefits compared to other cladding types. However, with continual treatments it should last at least 10 years. This is a large building and its apex roof does allow for taller storage requirements. However, the type of cladding used limits any additional storage potential. For example, it isn’t strong enough to accommodate interior shelving. So the internal space you see is literally the space that you can use. One of the benefits of this shed is the fact it is pretty easy to assemble compared to other similar sized buildings. The Overlap cladding isn’t as heavy as other types and the way it overlaps each panel makes it really easy to put together. The instructions are good and everything you need is included. As it isn’t as heavy you should find it doesn’t take a huge amount of time to build either. There’s no denying this building gives you exceptional value for money. As part of the value range, it comes at an incredibly low cost. 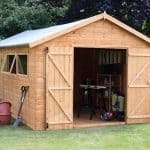 However, there is a possibility you will need to spend a lot of extra money on the shed due to the yearly treatments and strength-boosting upgrades you may need to invest in. 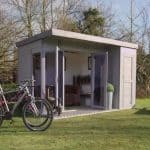 Final Thoughts: We’re surprised just how affordable this shed is. Although it is created with the cheapest style of cladding, it is still really durable and reliable. It also provides a lot of storage space. However, those looking for a building they can turn into a workshop may want to consider a different cladding type. 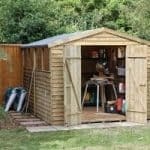 You would have to spend a considerable amount of money upgrading the shed to make it strong enough to be used as a work space. As a simple storage area however, this building is a good all-round model that comes with a range of water-resistant qualities. If you’re just looking for something basic, you will be more than happy with this shed.